Here is a bond investing secret. Look for value… just as you do with stocks. Look for contrasts distortions and trends that might affect value. When you do, you can get lucky. My British portfolio is up 9.38% in the last quarter… more than double the rise in the S&P for the same period. That’s luck created by a search for shunned investments that provide good value. British Hybrid bonds are interesting as a way to diversify into British pounds. Multi currency investors generally diversify into most major currencies but my portfolio has been shy the British pound. 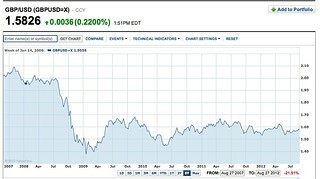 This is good as this chart from www.finance.yahoo shows… it is down 21.5% versus the US dollar. Click to enlarge this pound/dollar chart. This makes the pound interesting. Britain has economic problems and is in a double dip recession. When this type of trouble comes along markets tend to oversell. Britain’s economy and currency fundamentals such as current account and government deficit are not good, but not worse than the numbers for the USA. A 21% drop is huge and the chart shows plenty of room for the upside of the pound versus the greenback. From the August 18, 2012 “Trade, exchange rates, budget balances and interest rates” at Economist.com. Click on photo to enlarge. This makes the pound attractive so I started looking for investments in Britain. One of my private investment brokers sent me a British pound portfolio that balances growth and income with low to medium risk. Two of the British bonds in that portfolio offer very interesting yields. These bonds are issued by #1: Co Op Bank and #2: Skipton Building Society. That message explained that Skipton Building Society is Britain’s fourth largest building society (equivalent of a US Savings & Loan). I believed that the fall in the pound, the shakiness of the British economy… the fear of European financial institutions and the European Union’s economy had created an oversold situation. A 10% yield by a strong financial company in Britain seemed like great value so I invested in these Skipton Bonds. This Skipton Bond has a 10% interest rate fixed to 12th Dec 2013. If not called on December 12, 2013 (at Skipton’s option) then for the next five years interest is fixed quarterly at 695 basis points over the 3m Libor, which is currently 0.53%. So if interest rates remain unchanged then the coupon drops to 7.48%. This is an unusually rich floater purely as a result of the timing of the original issuance which was at the end of 2008. The Yield to Call is quite sensitive to the price which has now gone to 101.75. At this price the bonds yield 8.3% to call. This means my bonds have already had a nice jump… but this is just beginning because Britain’s economy and the pound are recovering. Britain exited a double-dip recession in the third quarter with the strongest growth in five years as Olympic ticket sales and a surge in services helped boost the rebound. Inflation cooled to the slowest in almost three years in September, while retail sales increased more than forecast. Gross domestic product rose 1 percent from the three months through June, the fastest growth since 2007, the Office for National Statistics said in London today. That exceeded the highest estimate in a Bloomberg News survey for growth of 0.8 percent. The median forecast of 33 economists was 0.6 percent. The pound rose after the data were published. This growth is good news for the world… for Europe… the British… the British pound and for pound bonds of good value. This good news also created a double profiting my portfolio… a rising capital value of the bond and a forex profit from a stronger British pound. I am investing more in the Skipton Bonds now though the yield has dropped to 8.3%. This still looks like a good value. In this increasingly complex global economy sorting our good investments can be hard work. One way to overcome much of the effort is to simply seek good value. Learn how to spot current good value investments at our next Super Thinking + Investing & Business seminar in Mt. Dora, Florida February 1-2-3, 2012.